The latest stop on our ThinkTank Road Show was another great event – this time in New York City. 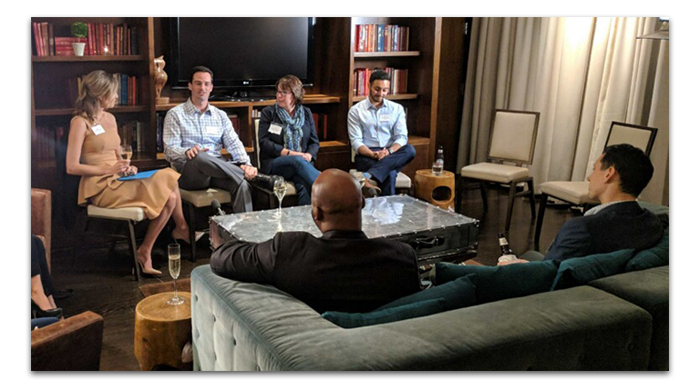 We recently launched this series of intimate gatherings as an opportunity for communication professionals to connect with peers and talk about their increasingly critical roles. Robyn Hannah, Senior Director of Global Communications at Dynamic Signal, moderated a great group conversation that included the insights of leading communication leaders from GE, Verizon, and MasterCard. Among the highlights of the event were deep dives into challenges surrounding cross-departmental collaboration, data-driven strategies, and seeing employees as, well, humans. Here’s a sampling of what we heard. Susan Warner, Senior VP of Internal Communications at Mastercard, noted that companies have finally reached a point where internal and external communication are getting equal weight and consideration from the executive suite as critical business functions. “That always hasn’t been the case,” Warner added. She also emphasized how “people have woken up to the power and the value of internal communications” and the key role in the overall story that a company shares. In the past, internal communications was a subset of external or were shoved under HR. Although there is still a lot of work to do in order to push our value forward, it’s inspiring to see well-known, traditional companies such as GE and Mastercard take bold steps toward prioritizing their internal communications efforts – and proving value to the organization. When executives discuss internal communications, the focus on “people” is a no-brainer. It’s all about employees, the engagement, and the culture. Today, however, as these departments branch out and organizational layouts evolve, lack of data plays a big part in keeping communication departments in “the back of the room.” So how can communicators get a seat upfront and capture the data that is required for them to be taken more seriously? The answer: cross-departmental allies. Employees don’t just sit under internal communications. They are the function of every team across the entire organization. This makes collecting data much more difficult. But part of that problem can be solved when you have allies across departments who can provide the data to help support internal communications efforts. We would all love to have employees who serve as 24-7 brand ambassadors. What a world it would be if we could rely solely on them to elevate positive conversations about our companies, both internally and externally. But this just isn’t the case. And companies need to let go of the control they have on how, when and where employees engage one another. Why? Because they’ll talk wherever and whenever they want anyway. The lesson here is not to fully disengage from employees, but rather to create a foundation of trust that gives them the benefit of the doubt. When you foster a culture that encourages conversations, good or bad, employees start to see their environment as a safe space to discuss concerns. We all know technology has changed the way we communicate in our everyday lives. This has real implications on the way company communications is executed – or at least it should. Internal communications has just become “Communications,” And this requires all of us to look at what that means in terms of how we engage employees. “I think employees expect what they have at home,” said Warner, from Mastercard. We want to extend a special thank you to everyone who participated in a great conversation at our first ThinkTank Roadshow event in New York. We love talking with professionals who are committed to improving workforce communication and creating awareness for the important work they’re doing. The way we all learn is when top communication leaders share their insights and their journeys. You can learn more here about our first event, which was held in Chicago. And please stayed tuned for information about when our Roadshow will be coming to a city near you.